ABSTRACT: Manufacturers are facing a major paradigm shift in their core business as the digitization of their products and manufacturing processes accelerates. Operational optimization of products is longer limited to basic data, but a rich set of quantifiable operational metrics. Similarly, product manufacturing is being optimized through massive streams of data. These streams of data can be utilized to also facilitate a move towards outcome-based business models, a business model that will grow in popularity as the Industry 4.0 / Industrial Internet of Things ecosystem continues to develop. Finished products are no longer an opaque box as customers are starting to expect that manufacturers will enable a contiguous collection of operational data and metadata across the product assembly, and in many cases, the entire supply chain. Now, when manufacturing products, companies now have the ability to track and analyze each step of the process. As such, these new expectations associated with manufacturing capabilities are forcing manufacturers to contend with a new variable – the data lifecycle. The data lifecycle (See Exhibit 2) describes how data is collected, organized and analyzed into actionable insights. The impact of data is not limited to solely the improvement of internal efficiency – the collection of data also enables new business opportunities. Differences in how manufacturers interact with the data lifecycle exist – in an internal environment, the manufacturer will go through all of the steps in order to understand and optimize its manufacturing processes. When selling into other companies, manufacturers will need to focus on having a wide variety of data collection available as well as the ability to connect to the variety of Big Data platforms available – this interconnectivity between devices drives a significant portion of the potential value from Industry 4.0 / IIoT and products without interconnectivity will be disadvantaged. While a daunting and complex task, recent advancements in technology have made it significantly easier for companies to manage the data lifecycle. For example, sensors have become significantly smaller, cheaper and more accurate, leading to better data acquisition across a variety of parameters. Moreover, with the development of cloud computing over the past decade, companies no longer have to invest in high-fixed cost data centers – instead storing the data generated in a secure private or hybrid cloud environment. 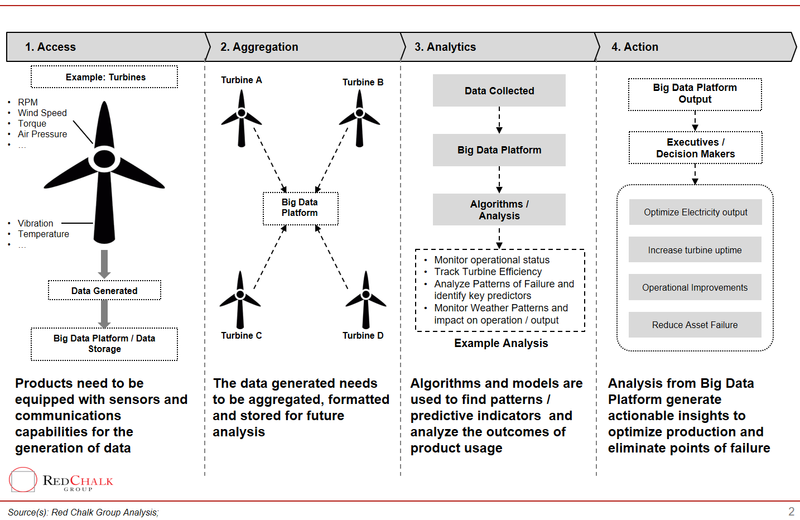 Finally, the burden of developing software to analyze the “big data” generated has been shifted to major industrial and software players such as GE and SAP. There are also a number of startups focused on data analysis for specific end-market applications, in addition to vendors providing a turn-key connectivity enablement product for manufacturers that do not want to build these capabilities internally. An industry-wide move towards open APIs, industry standards and interoperability has catalyzed investment in the space and further development of an open, interconnected ecosystem will drive adoption of elements of Industry 4.0 / IIoT. Instead, the real task for manufacturers is to determine what aspects of their process they want to monitor and improve at the operational level, and eventually the business models that can be enabled through effective delivery and management of the data lifecycle. For example, a turbine supplier can contractually guarantee uptime per month or an equipment manufacturer can sell products based on production increase throughput post-implementation. In addition, through outcome-driven models, manufacturers have an opportunity to increase their relevance to OEM customers given the “stickiness” that can be enabled through an enhanced delivery model and link to customer processes. For example, many customers may be unsure of what types of outcomes and improvements can be achieved – suppliers can work with OEM customers to analyze, evaluate, and recommend specialized solutions / outcomes based on knowledge of OEM customer processes. Some customers may seek out a broader value proposition from suppliers associated with data insights, assuming a customer lacks specific in-house capabilities. Customers may also look to their suppliers for help regarding which data-related partners to work with or how to best set up and organize their back-office functions. 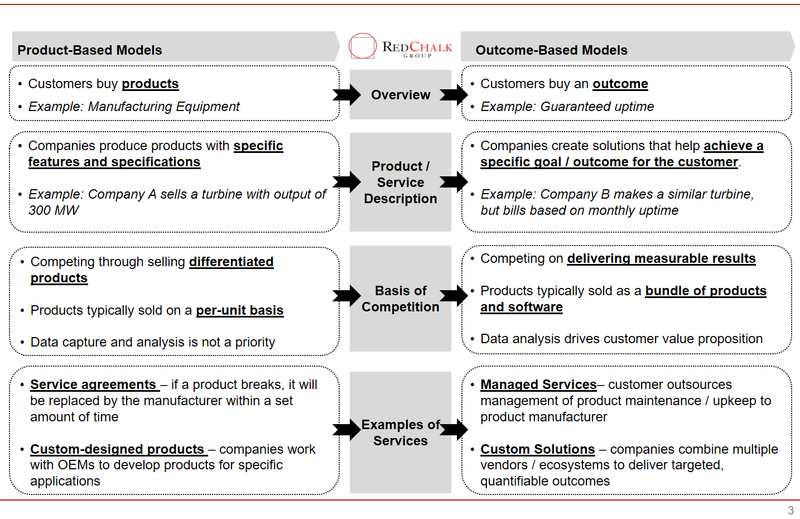 The shift to outcome-driven models also positions manufacturers and their suppliers for a sales approach reliant on services competencies, as opposed to one premised purely on product-application fit and features. One evolutionary business model blending outcome and service is preventative maintenance, whereby a supplier monitors their products remotely and utilizes real-time or historic data insights to predict problems or failures, facilitating a long-term relationship and quality assurance. Another model is throughput optimization, where data from the company’s manufacturing process is used to find points of failure or inefficiency with a proposed service to address these process issues. While the products provide the data used in these applications, the real value is generated through analysis of the data and the actions taken due to this analysis. In these circumstances, there is the potential for a manufacturer to offer additional ancillary services such as consultative services or on-site / embedded teams, increasing a manufacturer’s touchpoints with a customer and providing an up-sale opportunity. A model that has been garnering some interest across some industrial suppliers is a form of a “managed services” model, whereby operational staff is supplemented or supplanted by the original manufacturer. For example, in the compressor market, OEMs are taking on an approach to supplement maintenance crews at end-users by integrating monitoring solutions to ensure outcome targets are met. Collectively, these models afford suppliers with a differentiated business model in the near term, increased revenue options, and elevated strategic importance while end-customers leverage their supplier to help alleviate operational burdens / difficulties. These models are only available if there is a steady stream of accurate data and a specific, quantifiable, result that needs to be achieved. Most manufacturing suppliers and OEMs are still working on enabling their products with sensors and data collection, but there are a wide variety of startups and major tech players working on building out their Big Data analytics platforms for manufacturing-centric applications. We believe that the accumulation of experience / knowledge could provide early adopters a cumulative advantage in serving end customers with outcome-driven models, in addition to gaining valuable industry insights and market share. Early moves can also facilitate experimentation and time to test out early models with select sets of customers. Technology drivers and adoption cycles – how will technology adoption, both in the inclusion of sensors / connectivity in hardware and the development of advanced analytics capabilities, work to catalyze concepts? The evolution of services – most manufacturers and suppliers have typically gone to market with a volume-driven, transaction-driven model. An evolution to provide a breadth of service-focused models will take place, requiring an understanding of what these services should be and how they will be implemented. The risk for early adoption – while early moves have clear merit, companies will need to be thoughtful on the resources, effort, and scope of capabilities required to support the business models linked to Industry 4.0. Investment in Industry 4.0– Organic initiatives can succeed but in situations where considerable gaps exist in delivery, resources, and/or technology, what inorganic options exist to facilitate an evolution to Industry 4.0?